Many traditional marketing models now seem ancient and obsolete. New strategic models are needed – not just for text books and academics but for managers. Businesses need practical templates on which to build the next generation of actionable marketing strategies – with a mix of tactics that work online. Offline is still important – but the web is now your most important business battleground. If you lose the online battle then you lose the business war. Traditional business models no longer work and established businesses need to re-arrange their strategies – and in some cases their organisational structures – in order to compete effectively using the web. It’s a reminder that you need to embrace change as the only source of real progress. This is a magic formula. Each side of the triangle supports the other two sides. (It’s surprising how many brands fail to understand that). It all starts with effective content. 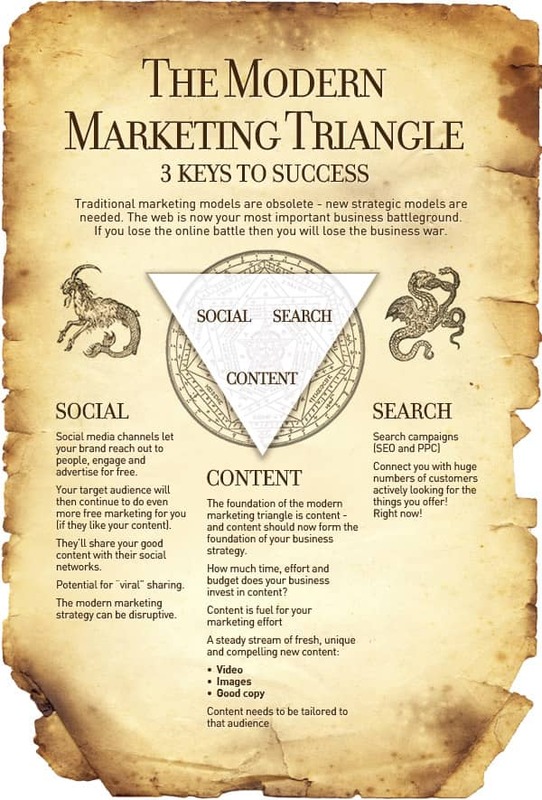 The foundation of the modern marketing triangle is content – and content should now form the foundation of your business strategy. But how much time, effort and budget does your business invest in content at present? It’s a vital question that every business must now answer with a proper content strategy. Content is much more than just your product information (although you probably need to make that much more compelling and unique too). Content is fuel for your marketing effort and your website is only one of many channel where it can be used. In addition to rich, unique and compelling product information, really successful online campaigns require a steady stream of fresh new content. Content creation doesn’t have to be hard and your content does not need to be highly polished. Some of the most effective content examples I’ve are just quick “how to do…” videos. The Carphone Warehouse’s Eye Openers are good examples. Nothing flashy here – but they’re rapidly approaching ten million views on YouTube thanks to simple, compelling and shareable content. Video is the most compelling and shareable form of content, followed by images, and good copy. It is the information (or emotion) within the content that’s important – and simple is usually better. Content needs to serve a specific purpose, which is usually to inform or just entertain. The easiest way to continually generate good content is to use a blog on your website. Content is the foundation of all good campaigns, especially search and social media campaigns. Search and social media campaigns are the most powerful and important components in your marketing strategy. Search campaigns (SEO and PPC) connect you with huge numbers of customers actively looking for the things you offer, right now! What could be more important, or more effective for your business? That’s why SEO and PPC are so important and why smart brands invest in search. SEO usually offers better ROI than anything else you could possibly do. PPC can generate a huge increase in sales very quickly. You really do need to be doing search campaigns in a serious way. Hiring an SEO agency is more effective than doing SEO in-house because SEO agencies do better SEO (here’s how and why). A good SEO agency will do lots of research to identify which keywords will deliver the strongest results and your content should be created to target those keywords effectively. (A bad SEO agency’s campaigns have no basis at all, they’re random and misguided). Search campaigns need fuel – they need content. It could be copy, images, video or audio… anything that is engaging to your target audience. Social media channels let your brand reach out to people, engage and (in a sense) advertise for free. Your target audience may continue to do even more free marketing for you if they like your content. When people are targeted effectively using good content their natural impulse is to share it with their social networks. Social recommendations may be the most powerful marketing message of all; certainly more powerful than anything your brand could possibly say or do itself. There is real potential for a “viral” outbreak of sustained sharing if your content is truly compelling. These are among the reasons why social media campaigns are so important. They also help explain why content is so important – because if you have no content then you have nothing to share with people on social networks. Without good, socially shareable content, you’re missing out on a lot of free social media marketing. Search engines increasingly use social media activity to measure the importance of web pages and good social media campaigns could drive sales by supporting SEO campaigns. Wake up to content, search & social! Unfortunately most businesses appear not to have noticed that the web has transformed the business landscape. You need to transform your business just to survive out there. And you need to start now, before your more forward-thinking competitors render you obsolete. It can happen very quickly. And it’s far easier and less exhausting to get ahead and stay ahead than constantly try to catch up. The modern marketing strategy can be disruptive – indeed it may need to be disruptive – and that may be a source of anxiety. A strategy for today’s online markets must break through silo walls, flooding digital enlightenment into other business functions. They may not like that at first. It can be scary. In some organisations the marketing function lacks the organisational power required to make the necessary changes. They are fundamental changes that need to be led from the top and now, more than ever before, it is vital for the chief executive and the board to buy in to the importance and power of the web. With understanding comes an opportunity to harness the power of content, search and social for sustained growth. Surely that should be the goal of every business organisation. But online campaigns require content. Media. If you are in business then you are now a media organisation! Like it or not, it’s true. People want to interact and engage with you online and that requires action to provide effective media. Engagement is not a passive process. If the content you publish is poor, if you can’t be found, if you fail to engage with people, then you will have failed: as a media organisation and as a business. But don’t worry: you have all the industry expertise you need right there in your business. Harness the power of your staff and hire a good agency to guide you through the labyrinth towards digital enlightenment. I help organisations build effective online strategies founded on content. Just call or email me if you need any help.